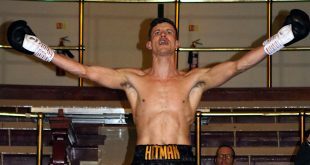 Friday night, at the York Hall, Bethnal Green, London, Barry Hearn (Matchroom Sport) hosted the next of the Prizefighter Series – 'Prizefighter the Light Middleweights’. As per the usual format – eight boxers challenged for the £32,000 Prize and winning trophy – the three-round quarter-final, semi-final and final all in one night. 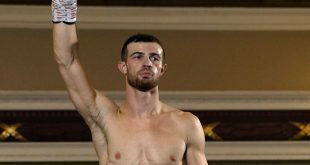 Despite his problems at weigh-in, it was tall Prince Arron of Droylsden who deservedly won the Prizefighter accolade – finally beating off Birkenhead man – Brett Flournoy in a thrilling finish. Arron won convincingly over George Hillyard in the quarter final to meet Favourite – Bradley Pryce in the semi’s. But Arron looked fresh and focussed against the tired-looking Welshman and again won on all three judges cards. 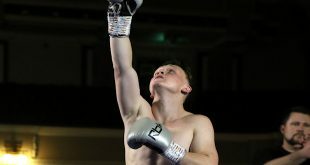 He then faced Brett Flournoy of Birkenhead and despite a gutsy display from Flournoy – Arron was not about to throw away his chance – sending the ‘Soul Man’ to the canvas in the third and final round – sealed his win. 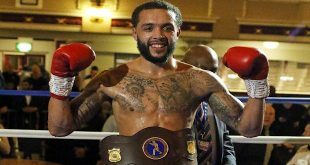 Dropping to his knees in celebration – Prince Arron became the newest Prizefighter Champion. His record now stands at 17 wins (1 by KO) 3 losses (2 by KO) and 1 draw.